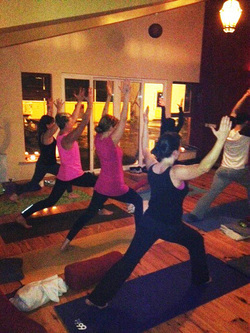 ​Hatha Yoga is a path toward creating balance. In our physical body we develop a balance of strength and flexibility. We also learn to explore a balance between effort and release in our internal attitude. The art of Yoga is in finding the relaxation within the action. ​​As you move and breath your joints wiil be brought through their full range of motion.Your muscles will be stretched and strengthened gradually returning your body to its natural alignment improving posture.Improved posture will lead to improved breathing and clarity of mind. 5. Drains your lymphs and boosts immunity. When you contract and stretch muscles, move organs around, and come in and out of yoga postures, you increase the drainage of lymph. This helps the lymphatic system fight infection, destroy cancerous cells, and dispose of the toxic waste products of cellular functioning. ​Just as we store memories of trauma in the body, we also can store memories of its release and the feelings of deep relaxation. Whatever we practice, we train the body to do. Therefore, it would seem advisable to train the body to release stress on command. Releasing the stress knots of the body and mind allows for clearer energy channels and clearer opening to our deeper selves as spirit.